About a month or two ago, I heard something on the radio that I could hardly believe. It was a commercial for the Oreck XL vacuum cleaner. The radio ad opened with some cheesy jingle that sounded like it was written in the 1970s. Then David Oreck, company founder and Electronic Retailing Award nominee for “Best Male Presenter,” came on to talk about the benefits of his Oreck XL vacuum cleaning product. Then at the end of the commercial, out of the blue, David Oreck sings! Mr. Oreck sang that cheesy jingle from the beginning of the commercial a cappella. David Oreck’s singing sounds just like you would expect David Oreck to sound like singing. 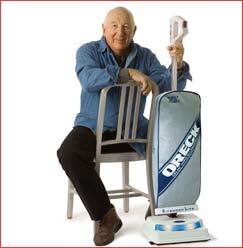 Ever since hearing that radio commercial I have been eager to get that Oreck ad recorded. However, although I have heard many other radio commercials for Oreck XL vacuum cleaners and air purifiers, I have never again heard that commercial with David Oreck displaying his vocal talents. This classic (for me) radio ad is probably lost forever. But if by any chance anyone has David Oreck trying to be the next American Idol recorded somewhere, please contact me. Otherwise, I guess we’ll just have to wait for the next edition of Golden Throats before we hear him sing again. Awwww, c’mon. Give Mr. Oreck a break. I contacted the company and talked with his kid about getting a copy of it – I thought it was so great!!! They thought I was just gonna make fun of it on my show. It would have been free publicity for ’em – Doh! Thanks for the Golden Thraots link. I am indebted. Paul have you had any luck in finding Dave singing yet? Let me know if you have – I know Music of Your Life use to play the ad.